Are you a hunter or a fisher? Or maybe you just want a way to preserve meat for longer term storage — other than freezing it. Well, drying meats is a way of preserving used years and years ago by the Indians and other ancient peoples. Indians would cut the meat into long strips and hang it up to dry in the wind and sun. They called it charqui (pronounced "sharky"). As English explorers moved into Indian territory, they picked up that name for dried meat, and it gradually changed to "jerky" or "jerked beef". Another method used by North American Indian tribes was to pound the dried meat with a rock and gradually mix it with fat, dried fruits, and vegetables. The result of this process was "pemmican". It provided an ideal food of concentrated energy packed for the trail. On rainy days, the Indians found their meat strips hanging in the rain instead of the sun and wind. So they moved it into the tepee and hung it over the smoking fire. The result was smoked jerky which had a delicious flavor and possibly prolonged its "shelf life". Meats can be dried in much the same way as fruits and vegetables; however, there are a few more precautions to take. Meat is made up of both lean and fat portions, and while the lean keeps well when dried, the fat portion will turn rancid. So to avoid this, only the leanest meats should be used, removing all possible fat before drying. This discussion is only about fully cooked meats (not jerky), which is a good way to preserve leftover roast turkey or pot roast. Information on how to make your own jerky can be found here. Slice it thin, or cut in 1/2 inch cubes, or grind it if you like (it will dehydrate faster when ground up). Dehydrator: Spread the cubes sparingly over trays and dry at 140 degrees F (60 degrees C) for about 6 hours (or follow the directions that came with your dehydrator). Oven: Spread over trays and dry at 140 degrees F for about 6 hours, then stir cubes/slices and lower temperature to 130 degrees F (55 degrees C) and continue drying until hard. Keep door of oven ajar. Sun: Spread cooked cubes in a thin layer over trays and place in a well-ventilated place in full sun. Dry until hard, stiring occasionally. Drying time will depend on the weather and the moisture in the meat, but should be from 2-3 days. Take trays inside at night. Pour 1 cup of boiling water over 1 cup meat cubes. Soak for 3 to 4 hours, or until water is absorbed. Use in any recipe calling for cooked meat. Or pour boiling water over meat and simmer over low heat for 45-50 minutes. 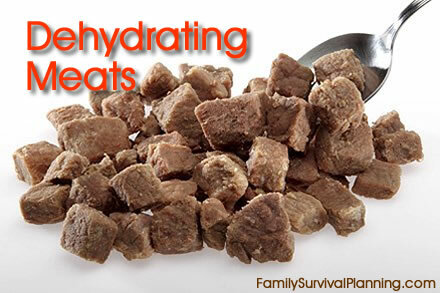 What is the shelf life of dehydrated meat? If it is properly prepared and kept in a cool, dry place, very lean beef, venison, poultry, lamb, and fish can have a shelf life of a year or more. Pork does not dry or store well because of the high fat content, but lean ham can be dried and stored for several months. I personally would vacuum seal dehydrated meat in the appropriate bags, but using oxygen absorbers will also remove the oxygen if the meat is put into a canning bottle.